This study describes the formation of multicomponent crystal (MCC) of desloratadine (DES). The objective of this study was to discover the new pharmaceutical MCC of DES using several coformers. The MCC synthesis was performed between DES and 26 coformers using an equimolar ratio with a solvent evaporation technique. The selection of the appropriate solvent was carried out using 12 solvents. The preview of the MCC of DES was performed using polarized light microscopy (PLM). The formation of MCC was confirmed using powder X-ray diffraction (PXRD), differential scanning calorimetry (DSC), fourier transform infrared spectroscopy (FTIR), and scanning electron microscopy (SEM). The accelerated stability of MCC at 40 °C and relative humidity of 75% was investigated using PXRD and FTIR. Depending on the prior evaluation, DES and benzoic acid (BA) formed the MCC. 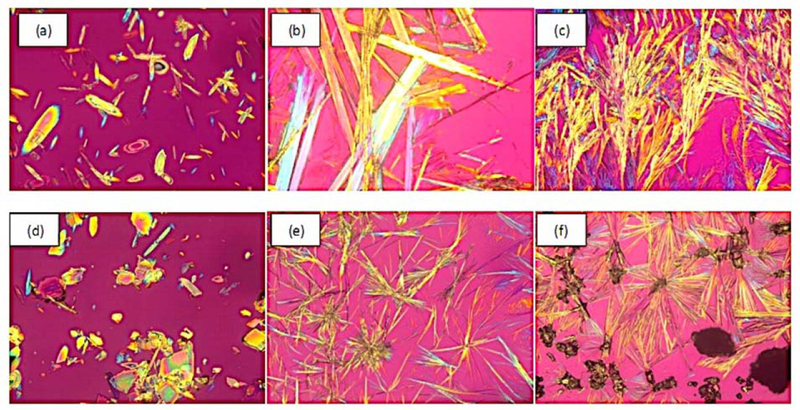 PLM and SEM results showed that crystal habit of combination between DES and BA differed from the constituent components. Moreover, the diffractogram pattern of DES-BA was distinct from the constituent components. The DSC thermogram showed a new peak which was distinct from both constituent components. The FTIR study proved a new spectrum. All characterizations indicated that a new solid crystal was formed, ensuring the MCC formation. In addition, DES-BA MCC had both chemical and physical stabilities for a period of 4 months. Foeniculum vulgare (F. vulgare, Apiaceae) is an important plant currently used in folk medicine to treat various diseases including infections and inflammatory conditions. In this study we have investigated the immunomodulatory and apoptosis-inducing activities of the fractions from this plant. We prepared dichloromethane, hexane, butanol, and water fractions from the aerial parts of the plant. We examined the growth inhibitory effects of the fractions on proliferative lymphocytes by the BrdU incorporation assay. Cell viability was determined by the propidium iodide (PI) assay. AnnexinV/PI staining and cell cycle analysis by flow cytometry was performed to investigate the apoptosis-inducing effects of the plant fractions. Cytokine levels were measured by enzyme-linked immunosorbent assay. All fractions reduced cell proliferation of the activated lymphocytes. The dichloromethane fraction with the highest inhibitory effect (IC50, 19.8 μg/mL) significantly reduced cell viability. 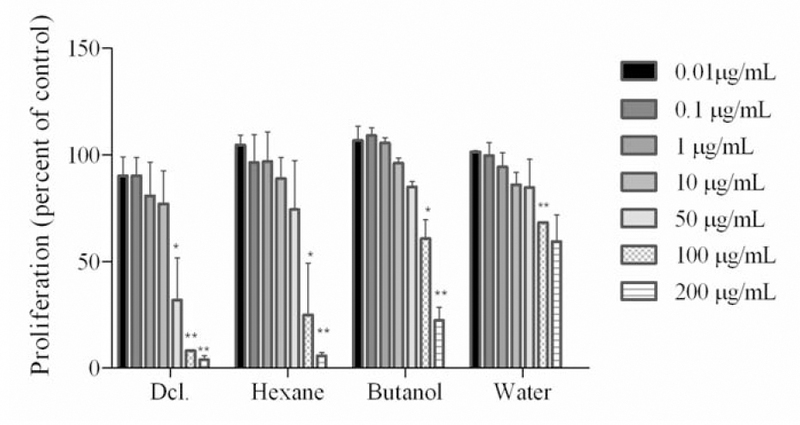 Although the butanol fraction inhibited cell growth (IC50, 88.2 μg/mL) it did not affect cell viability. Annexin V/PI and cell cycle analysis showed the maximum apoptosis-inducing effect of the dichloromethane fraction at 200 μg/mL. Cytokines, that included interleukin (IL)-4 (22.8 ± 0.9 pg/mL, P < 0.05) and interferon (IFN)-γ (651 ± 37.5 pg/mL, P < 0.01) reduced the activated lymphocyte levels in cultures in the presence of 100 μg/mL concentration of butanol fraction compared to the untreated control. In conclusion, the dichloromethane fraction of F. vulgare had the capability of inducing apoptosis in the activated lymphocytes, whereas the butanol fraction reduced cell activation and cytokine secretion. These data suggested the potential of these examined fractions for more studies in terms of their beneficial effects on immune-mediated diseases. A novel series of antimony (V) complexes with the hydroxypyranone and hydroxypyridinone ligands were synthesized and characterized by 1HNMR, FT-IR and electron spin ionization mass spectroscopic (ESI-MS) techniques. The synthesis process involved protection of hydroxyl group followed by the reaction of the intermediate with primary amines and finally deprotection. All compounds were evaluated for in vitro activities against the amastigote and promastigote forms of Leishmania major. Most of the synthesized compounds exhibited good antileishmanial activity against both forms of L. major. 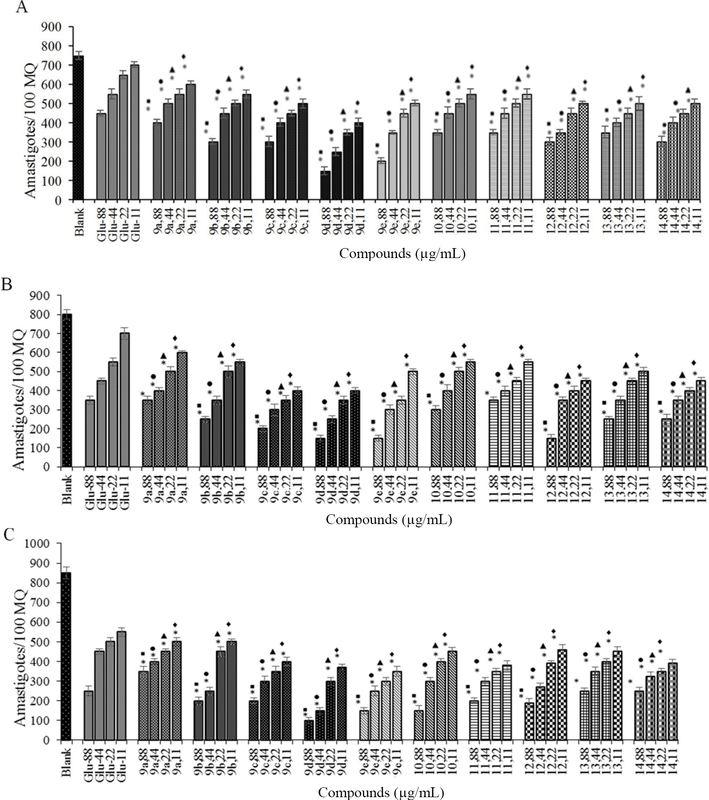 IC50 values of the most active compounds; 9d, 9d and 9e, after 24, 48 and 72 h against amastigote model were 15, 12.5 and 5.5 μg/mL, respectively. 9e, 11 and 9e inhibited the promastigote form of parasite after 24, 48 and 72 h with IC50 values of 10, 2 and 1 μg/mL, respectively. Finding products with antiapoptotic activities has been one of the approaches for the treatment of neurodegenerative disorders. Serum/glucose deprivation (SGD) has been used as a model for the investigation of the molecular mechanisms of neuronal ischemia. Recent studies indicated that glucosamine (GlcN) and N-acetyl glucosamine (GlcNAc) have many pharmacological effects including antioxidant activities. The present study aimed to investigate the protective effects of GlcN and GlcNAc against SGD-induced PC12 cells injury. The PC12 cells were pretreated with GlcN and GlcNAc for 2 h, and then exposed to SGD for 6, 12 and 24 h. Cell viability was evaluated by MTT assay. The level of intracellular reactive oxygen species (ROS) was determined by flow cytometry using 2’,7’- dichlorofluorescin diacetate (DCFH-DA) as a probe. SGD condition caused a significant reduction in cell survival after 6, 12, and 24 h (P < 0.001). Pretreatment with GlcN and GlcNAc (0.6-20 mM) increased cell viability following SGD insult. A significant increase in cell apoptosis was observed in cells under SGD condition after 12 h (P < 0.001). Pretreatment with GlcN and GlcNAc (5-20 mM) decreased apoptosis following SGD condition after 12 h. SGD resulted in a significant increase in intracellular ROS production after 12 h. Pretreatment with both amino sugars at concentrations of 10 to 20 mM could reverse the ROS increment. Results indicated that GlcN and GlcNAc had a cytoprotective property against SGD-induced cell death via anti-apoptosis and antioxidant activities, suggesting that these aminosugers have the potential to be used as novel therapeutic agents for neurodegenerative disorders. The aim of the present study was to evaluate the effects of oregano essential oil (OEO) on the hippocampus and prefrontal cortex TLR 2/4 gene expression and depressive like behavior induced by chronic unpredictable stress (CUS). Sucrose preference and forced swim tests were adopted to examine the antidepressant effect. Control (CON), OEO, CUS, and CUS + OEO groups were used. The OEO and CUS + OEO groups received OEO (0.2 mL/kg, i.p. ), CON and CUS received saline (0.2 mL/kg, i.p. ), and the positive drug groups of CUS rats received fluoxetine (10 mg/kg) and diazepam (3 mg/kg) once daily for 14 days. The expression of TLR 2/4 was determined using real time quantitative polymerase chain reaction with the SYBR green reporter dye. The compositions of the OEO were determined by gas chromatography-mass spectroscopy. The main constituents were thymol (20.72%), gamma-terpinene (8.83%), borneol (8.72%), cymene (6.83%), carvacrol (6.274%), alfa-terpinene (5.26%), and sabinene (4.92%). Administration of OEO significantly alleviated the depressive symptoms of CUS. A higher level of TLR2/4 mRNA was seen in the brain of CUS group (P < 0.05). The CUS-induced increases in the TLR2/4 levels were not reversed by OEO. According to the present study OEO may have the antidepressant-like activity but have no effect on the stress-induced TLR-2/4 upregulation. Diabetes mellitus is developed by lack of insulin secretion or reduction of tissues sensitivity to insulin, which lead to serious complications. The aim of this study is to evaluate antihyperlipidemic effect of betulinic acid (BA) on streptozotocin-nicotinamide (STZ-NA) induced diabetic mice. In this experimental study, seventy adult male NMRI mice (20-25 g) were divided randomly into seven groups (n = 10) of control, sham, diabetes, diabetes + BA (10, 20 and 40 mg/kg), and diabetes + metformin (200 mg/kg). Diabetes was induced by intraperitoneal (i.p.) injection of a single dose of STZ (50 mg/kg) 15 min after an i.p. administration of nicotinamide (NA) (120 mg/kg). BA and metformin were orally administered and after two weeks blood samples were taken. Blood levels of leptin, adiponectin, lipid profile and liver enzyme were then measured. 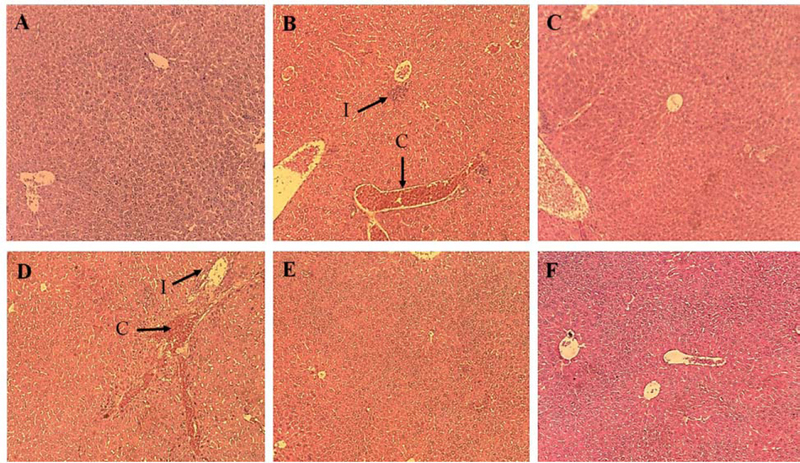 One day after the last drug administration, liver was removed to evaluate the histological changes. A significant increase (P < 0.05) in the plasma levels of leptin, alanine-aminotransferase (ALT), aspartate-aminotransferase (AST), alkaline phosphatase (ALP), low density lipoprotein cholesterol (LDL-C), cholesterol, and a significant decrease in adiponectin and high density lipoprotein cholesterol (HDL-C) were observed in diabetic mice. The groups treated with BA indicated a significant decrease in leptin, AST, ALT, ALP, TG, cholesterol, LDL-C and an increases in adiponectin and HDL levels, while VLDL did not show significant changes. BA was found to have positive effects on liver injury. BA has an effective role on liver damage induced by diabetes through amelioration of leptin, adiponectin, liver enzyme levels and lipid profile. Since BA has a positive effect on lipid profile, adiponectin and leptin, it may improve metabolic syndrome. Berberis integerrima Bonge. (Syn: Berberis densiflora Boiss. & Buhse) is a shrub widely distributed in Middle East and central part of Asia. An ethnobotanical study revealed that indigenous and tribal people in Iran use B. integerrima root decoction for treatment of brucellosis. Therefore, the aim of this study was bioassay directed isolation of antibacterial compounds from this plant based on their in vitro bactericidal activity against Brucella abortus. Briefly, the ethanol extract of B. integerrima was fractioned and subjected to preliminary antibacterial screening tests against Brucella. The more active fraction (Fr.3) was subjected to purification by repeated chromatography systems. Quaternary benzylisoquinoline alkaloids including columbamine, palmatine, berberine, and jatrorhizine were four main components identified in the selected active fraction. Except for berberine which is reported before, palmatine, columbamine and jatrorhizine are isolated for the first time from this plant. Anti-brucellosis properties of isolated compounds 1-4 were studied against B. abortus under different test conditions. In minimum inhibitory concentration (MIC) and minimum bactericidal concentration (MBC) results, jatrorhizine (4) showed more antibacterial activity with MIC and MBC of 0.78 and 1.56 μg/mL, respectively. In both agar well diffusion and disk diffusion ANOVA results showed that there were statistically significant differences between compounds 1-4 versus placebo in all of the tested concentration (P <0.001). In conclusion, all of four alkaloids showed potent antibacterial activity against B. abortus but jatrorhizine and columbamine with free hydroxyl group on C-3 or C-2 showed more activity than palmatine and berberine without any free hydroxyl group on their structures. The antibacterial effects of columbamine (15 μg/mL) and jatrorhizine (15 μg/mL) were comparative to streptomycin (10 μg/mL) as standard drug which candidate them for more pharmacological researches to find new antibacterial agents against brucellosis. Cadmium (Cd), a ubiquitous environmental and occupational pollutant, acts as a metalloestrogen to induce cell proliferation. It is suggested that Cd may also contribute to the development of estrogen-related cancers like ovarian cancer which is the most lethal cancer in women. Furthermore, it was shown that melatonin has antiproliferative effect on estradiol (E2)-induced proliferation. The aim of the present study was to evaluate whether melatonin inhibits Cd-induced proliferation in ovarian cancer cell lines and also whether Cd and melatonin can modulate estrogen receptor α (ERα) expression. OVCAR3 and SKOV3 human ovarian cancer cell lines were treated with CdCl2 (1-100 nM) and melatonin (1 μM) for 48 h. Cell proliferation evaluation was carried out by bromodeoxyuridine (BrdU) incorporation assay. ERα expression was detected by western blotting method 24 h after cell treatment. The results were demonstrated that Cd increased proliferation of ovarian cancer cell lines in a dose dependent manner. Melatonin inhibited Cd-induced proliferation of OVCAR3 and SKOV3 cell lines. Moreover, CdCl2 significantly increased ERα expression in both OVCAR3 and SKOV3 cell lines compared to control. Melatonin significantly inhibited Cd inducing effect on ERα expression of OVCAR3 and SKOV3 cell. In conclusion, due to the proliferative effect on ovarian cancer cell lines, Cd could play an important role in the etiology of ovarian cancer by inducing cells ERα expression. Furthermore, melatonin has the protective role on Cd-induced cell proliferation by inhibition of ERα expression. A series of novel sorafenib analogues containing a quinoxalinedione ring and amide linker were synthesized. A total of 9 novel compounds in 6 synthetic steps were synthesized. Briefly, the amino group of p-aminophenol was first protected which then followed by O-arylation with 5-chloro-2-nitroaniline to provide compound d. Reduction of the nitro group of compound d and cyclization of the diamine group of compound e with oxalic acid afforded compound f which on deacetylation yeilded compound g. Then compound g was reacted with different acyl halides to afford the target compounds 1h-1p. 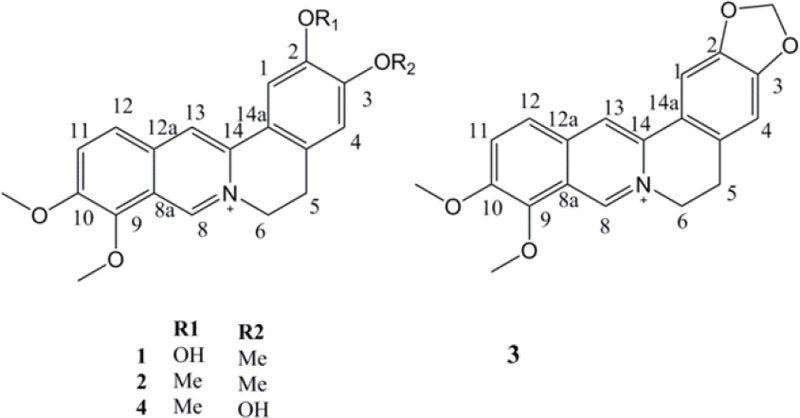 Chemical structures of synthesized compounds were confirmed by 1H NMR and FT-IR analysis. All compounds were evaluated at 1, 10, 50 and 100 μM concentrations for their cytotoxicity against HeLa and MCF-7 cancer cell lines. Some of the compounds showed good cytotoxic activity, especially compounds 1i and 1k-1n with the IC50 values of 19, 16, 22, 18, and 16 μM against MCF-7 cell line and 20, 18, 25, 20, and 18 μM against HeLa cell line, respectively. Recently a cross talk between angiotensin 1-7 (Ang1-7) receptor (MasR) and angiotensin II receptors types 1 and 2 (AT1R and AT2R) has been highlighted. The effects of MasR antagonist (A779) compared to the vehicle on the renal blood flow (RBF) and renal vascular resistance (RVR) responses to Ang1-7 (300 ng/kg/min) infusion in the absence of Ang II receptors in male and female rats were determined at controlled renal perfusion pressure. Ang1-7 infusion did not alter mean arterial pressure in male and female rats. However, A779 compared to vehicle increased RBF (18% vs 3%) and decreased RVR (13% vs 4%) responses to Ang1-7 infusion significantly (P < 0.05) in male when AngII receptors were blocked. Such observation was not occurred in female animals. Finally it was concluded that renal vascular responses to Ang1-7 administration may not be exerted by MasR in male rats, and these responses are not mediated with AngII receptors.